This website took thirty-five to forty hours of research and design time. 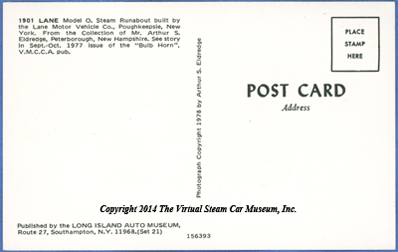 Thank you for supporting the Virtual Steam Car Museum! The first Lane, Model No. 1, was a four-passenger with a 2-cylinder steam engine under the body. 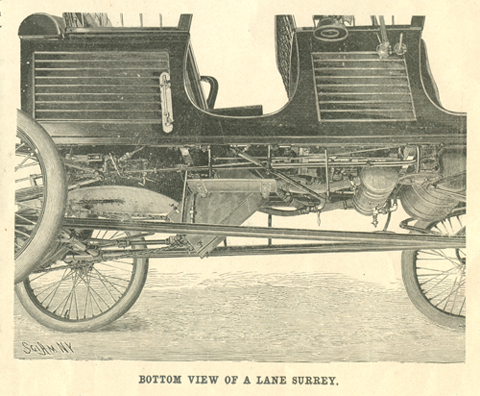 These cars grew larger, with boilers under front hoods, although all used 2-cylinder engines, later of compound type, up to 30 hp and operating at 350 psi. The last and largest model was on a 125" wheelbase. A total of 22 different models were build during the Company's manufacturing life. 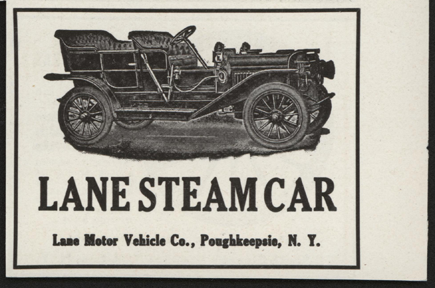 The Lane Motor Vehicle Company was among the most aggressive advertisers of its steam cars. Its promotion began as early as 1902 and progressed through 1910. 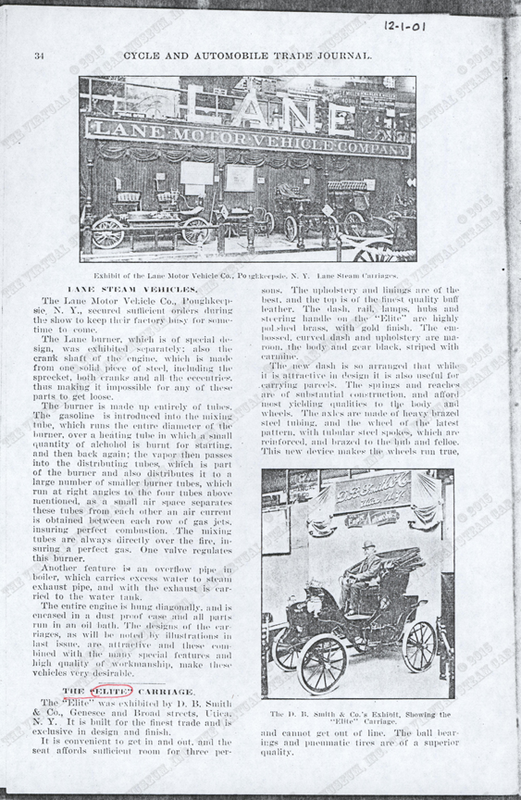 The Cycle and Automobile Trade Journal featured the Lane Motor Vehicle Company on page 34 of its December 1901 issue. 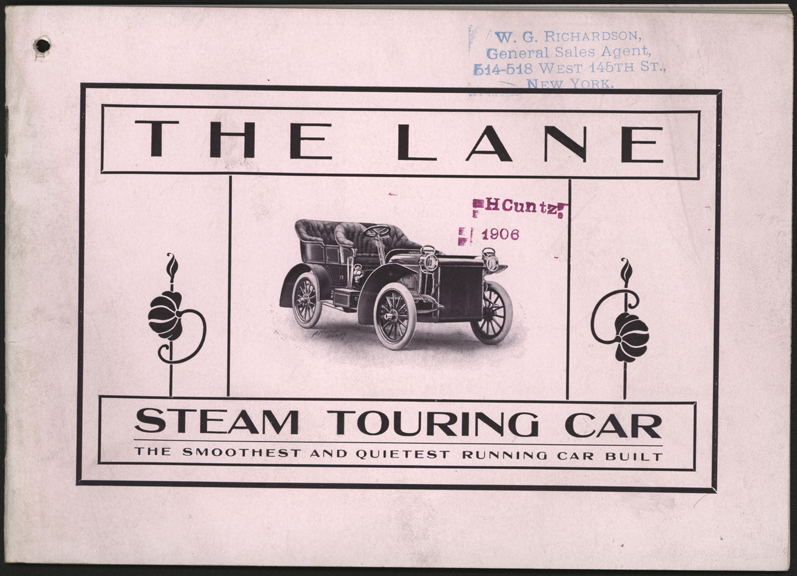 The Lane shared the page with the Elite Steam Carriage, made by D. B. Smith & Company. John A. Conde Collection. 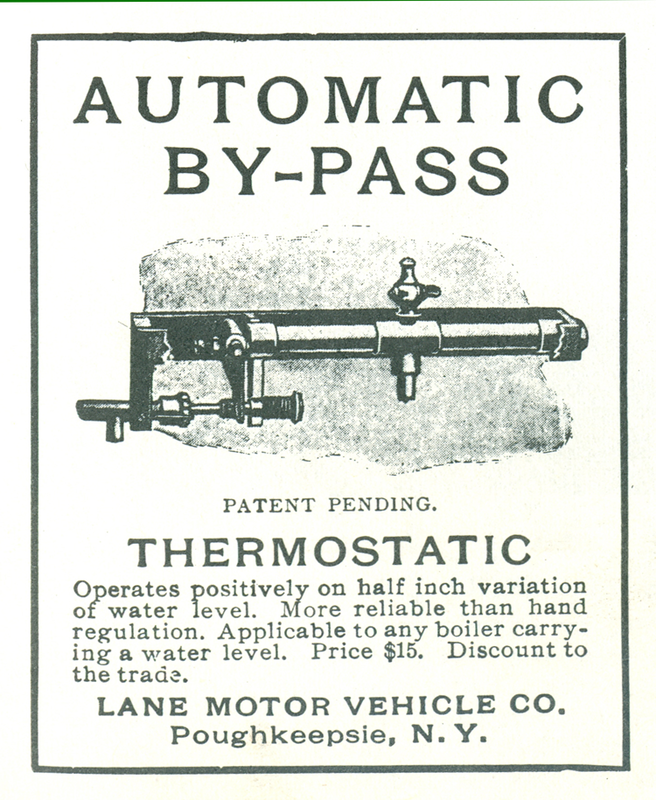 The Lane Motor Vehicle Company advertised in the Scientific American, as did many early automobile manufacturers. This "article" is actually a paid advertisement. March 1, 1902 p. 138. The entire text is found at the end of this web page. The undercarriage of the Lane, as illustrated in the Scientific American on March 1, 1902 p. 138. 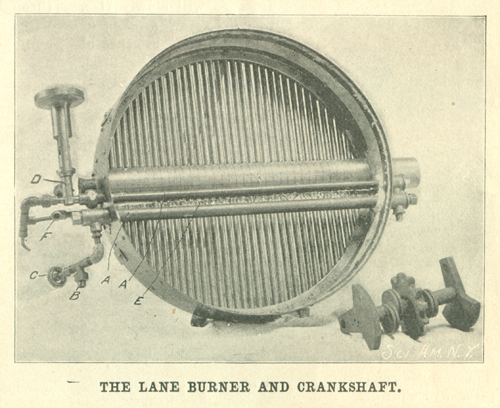 As did many, if not most, early automobile companies, the Lane promoted its superior technology, here are illustrations of its engine, burner, and crankshaft as illustrated in the Scientific American on March 1, 1902 p. 138. 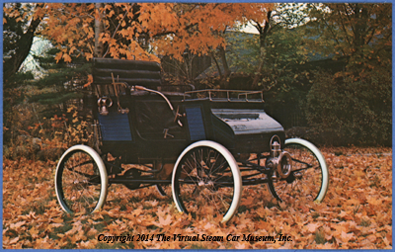 This is the earliest Lane Motor Vehicle Company magazine advertisement in the VSCM collection. Lane placed it in the March 8, 1905 edition of the Horseless Age, p. xxxvii. 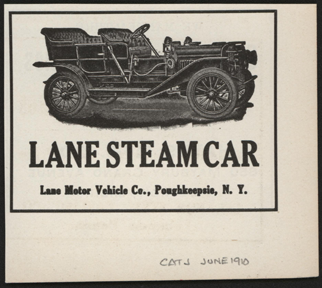 This is the earliest Lane Motor Vehicle Company magazine advertisement in the VSCM collection. Lane placed it in the March 8, 1905 edition of the Horseless Age, p. xxxvii. John A. Conde Collection. 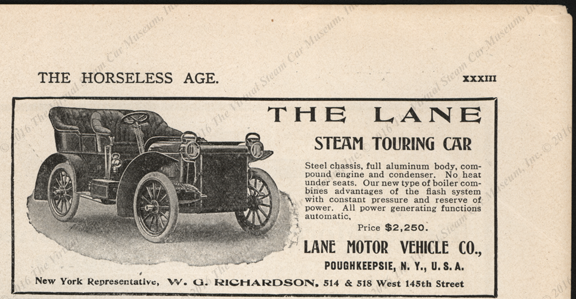 The Lane Motor Vehicle Company placed this advertisement in the March 15, 1905 edition of the Horseless Age. John A. Conde Collection. 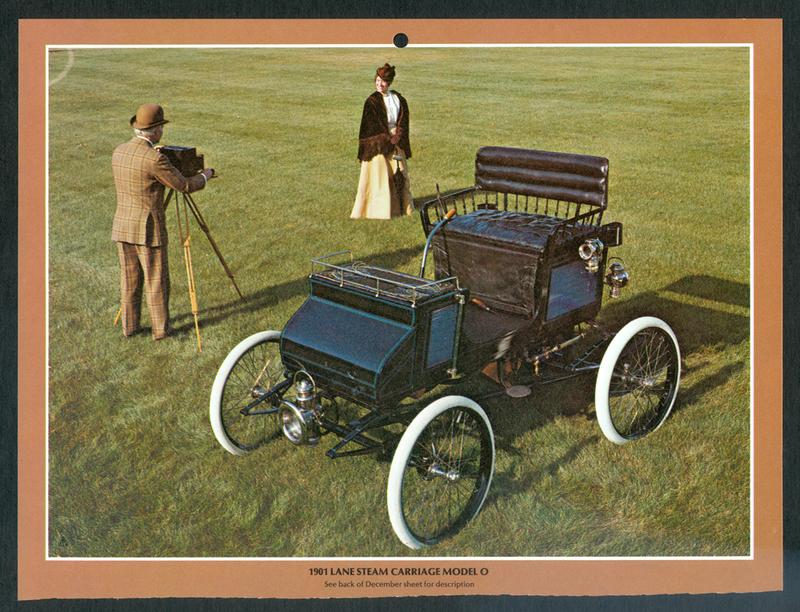 Floyd Clymer reproduced an identical ad in his Steam Car Scrapbook. The Lane Motor Vehicle Company placed this advertisement in the April 1905 edition of Cycle and Automobile Trade Journal. John A. Conde Collection. The Lane Motor Vehicle Company placed this advertisement in the June 1905 edition of Cycle and Automobile Trade Journal. John A. Conde Collection. 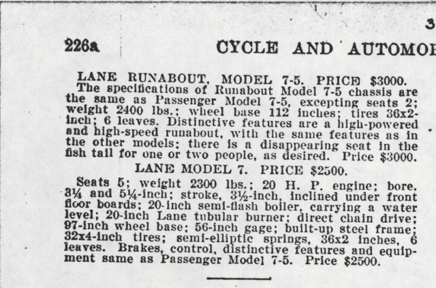 The Lane Motor Vehicle Company placed this advertisement in the September 1905 edition of Cycle and Automobile Trade Journal, p. 218. John A. Conde Collection. The Lane Motor Vehicle Company placed this advertisement in the October 1905 edition of Cycle and Automobile Trade Journal. John A. Conde Collection. 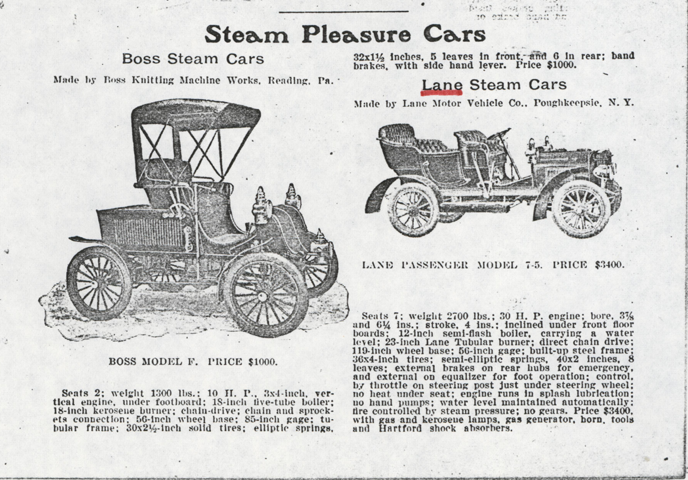 The Lane Motor Vehicle Company placed this advertisement in the October 4, 1905 edition of Horseless Age. Photocopy. John A. Conde Collection. The Lane Motor Vehicle Company placed this advertisement in the October 18, 1905 edition of Horseless Age. Photocopy. John A. Conde Collection. 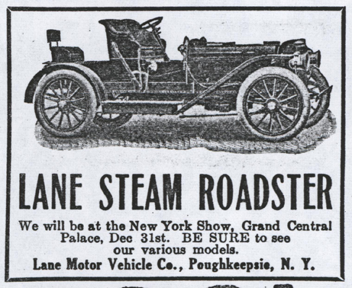 The Lane Motor Vehicle Company placed this advertisement in the November 29, 1905 edition of Horseless Age. The Lane Motor Vehicle Company placed this advertisement in the December 1905 edition of Cycle and Automobile Trade Journal. W. G. Richardson of New York appears on this advertisemetn for the first time. His name appears on all subsequent advertising. The file stamp on the catalogue below identifies him as the "General Sales Agent." John A. Conde Collection. 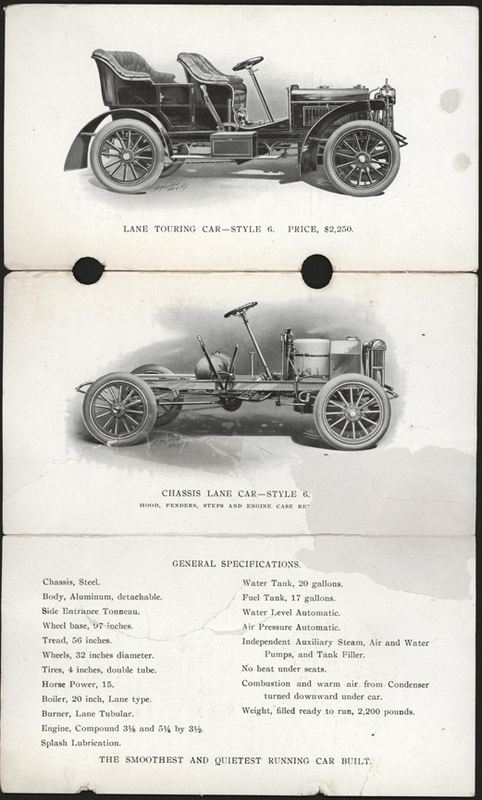 The Lane Motor Vehicle Company published this trade catalogue in 1905. It promoted the company's Style 6 steam car. The missing section on the front cover may have included a file stamp for the Automobile Manufacturers Association. John A. Conde Collection. These two Lane Steam cars are found in Floyd Clymer's Steam Car Scrapbook, (1945, Bonanza Books, Crown Publishers, Inc.), p. 67. Clymer lists no source. ca: Late 1905 - 1906. 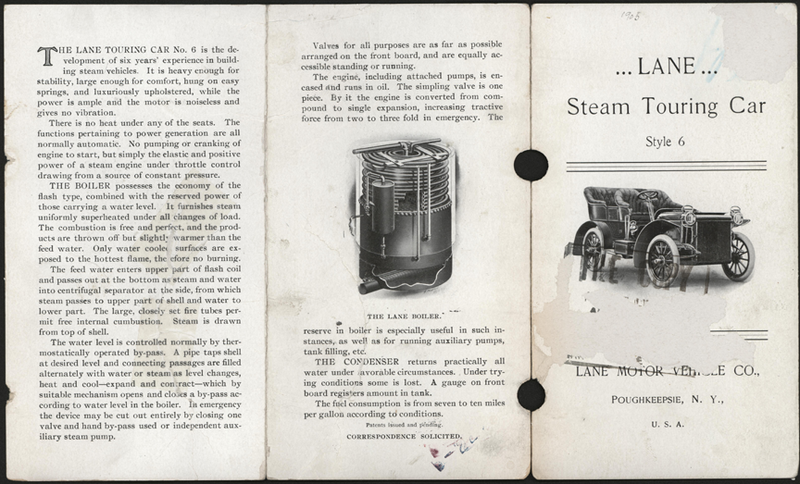 The Lane Motor Vehicle Company produced this 24-page trade catalogue to promote its Style 6 car. The cover is stamped "H CUNTZ 1906" and carries the file stamp of a local dealer, W. G. Richardson of New York. John A. Conde Collection. Lane's New York Agent, W. G. Richardson, placed this advertisement in the January 3, 1906 issue of Horseless Age, p. xxxiii. Lane's New York Agent, W. G. Richardson, placed the same advertisement in the January 10, 1906 issue of Horseless Age, p. LiV. 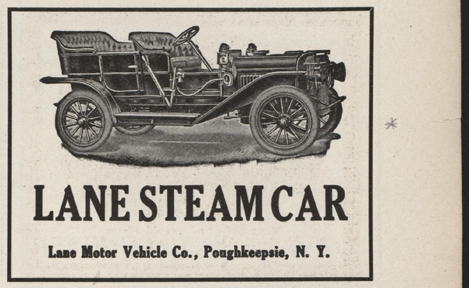 This Lane Motor Vehicle Company magazine advertisement appeared in the Cycle and Autombile Trade Journal for May 1906, p. 336. John A. Conde Collection. 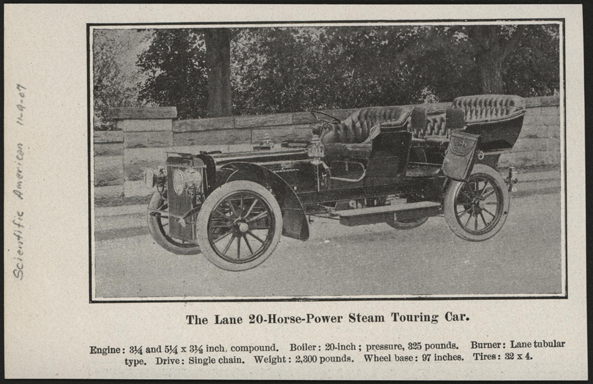 The Lane Steam Touring Cars were advertised in Cycle & Automobile Trade Journal, August, 1906, p.263. It was apparently placed by W. G. Richardson of New York. 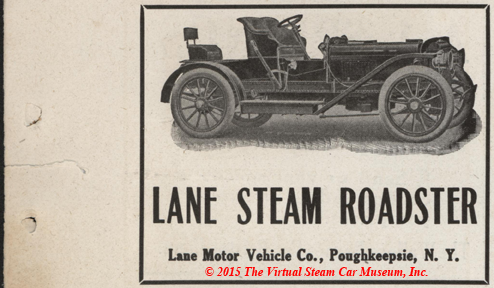 This Lane Motor Vehicle Company magazine advertisement appeared on January 16, 1907 in The Horseless Age, Vol. 19, No. 3, p. ix. 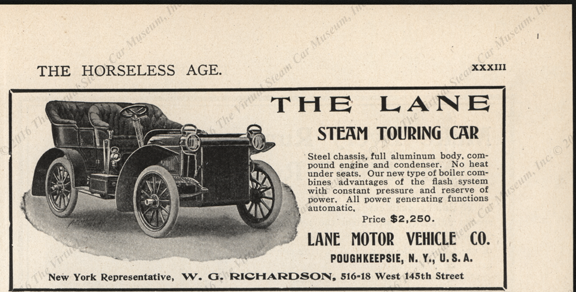 This Lane Motor Vehicle Company magazine advertisement appeared in the Cycle and Autombile Trade Journal for January 1907, p. 433. W. G. Richardson's name appears. John A. Conde Collection. The Lane Motor Vehicle Company did not change its Cycle and Autombile Trade Journal for February 1907, p. 499. John A. Conde Collection. 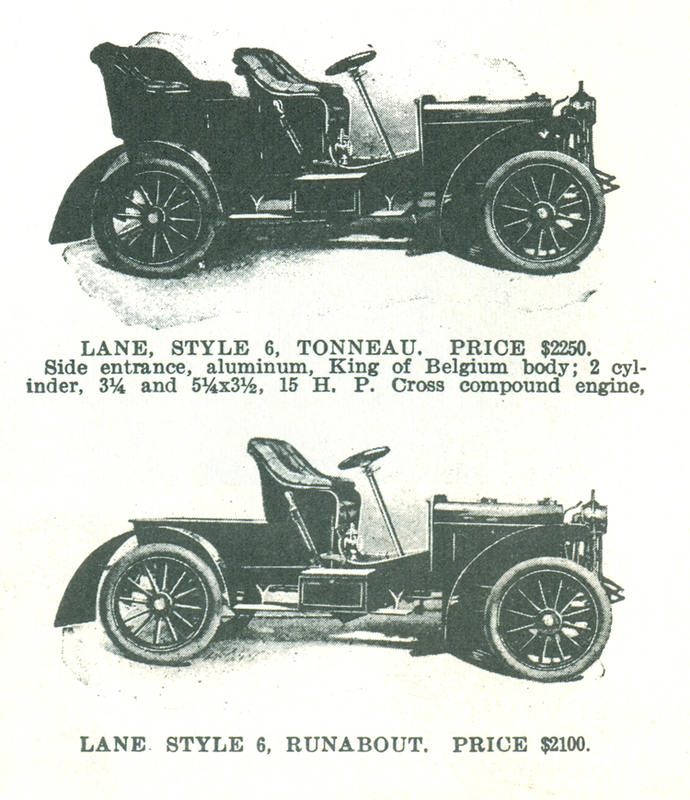 The Lane Motor Vehicle Company promoted its Models 7 and 7-5 in this Cycle and Autombile Trade Journal for March 1907, p. 226 - 226a. It shared page space with the Boss Knitting Machine Works. Photocopy. John A. Conde Collection. The Lane Motor Vehicle Company its January and February advertisements in the Cycle and Autombile Trade Journal for March 1907, p. 453. John A. Conde Collection. The Lane Motor Vehicle Company advertisement appeared in the Cycle and Autombile Trade Journal for September 1907, p. 309. 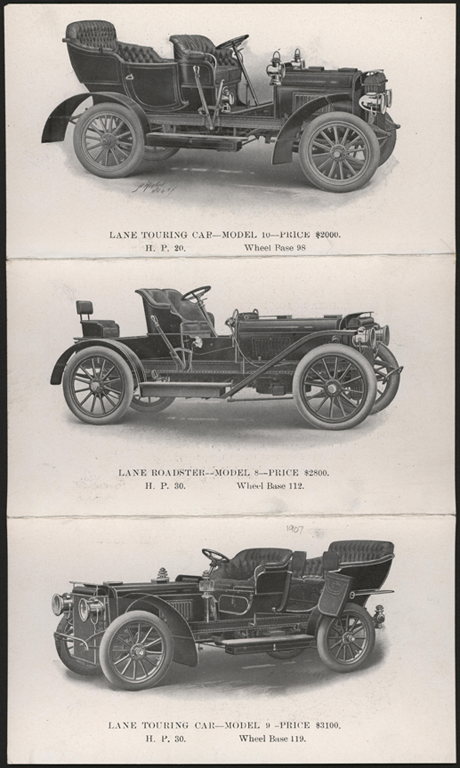 By November 1907, the Lane Motor Vehicle Company redesigned its advertising and offered four different models. It dropped W. G. Richardson's name. Cycle and Autombile Trade Journal. John A. Conde Collection. 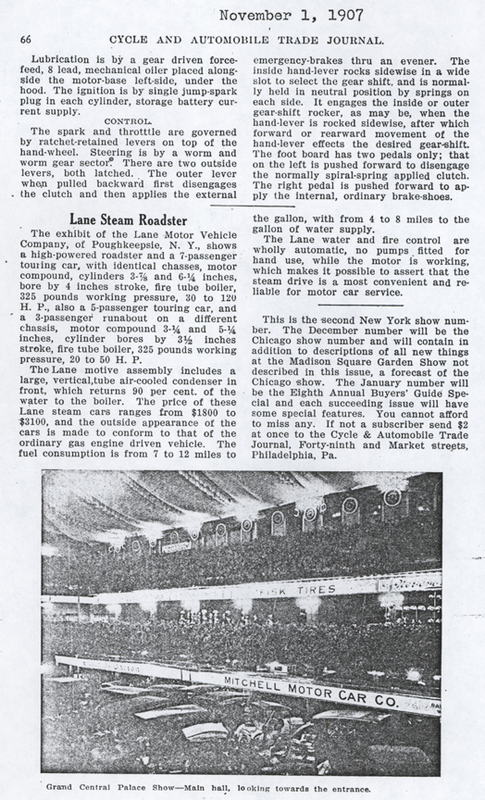 The November 1907 Cycle and Autombile Trade Journal carried an article on page 66 about the Lane Motor Vehicle Company exhibit at the New York Auto Show. Photocopy. John A. Conde Collection. 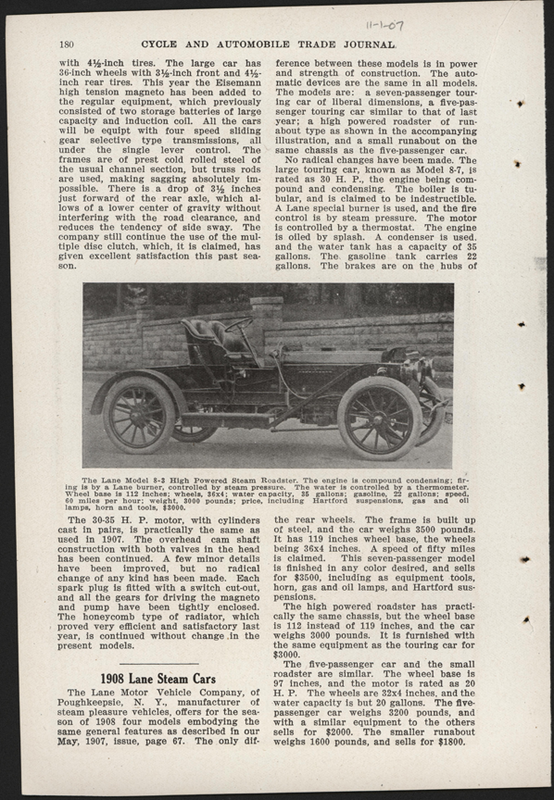 The November 1907 Cycle and Autombile Trade Journal also carried this article about the Lane Motor Vehicle Company's new 1908 models on p. 180. John A. Conde Collection. 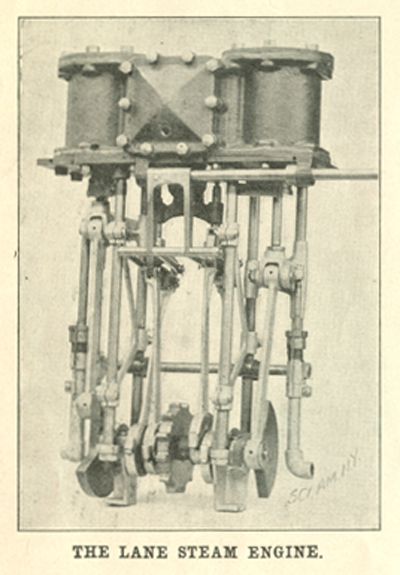 This image appeared in Scientific American on November 9, 1907. John A. Conde Collection. 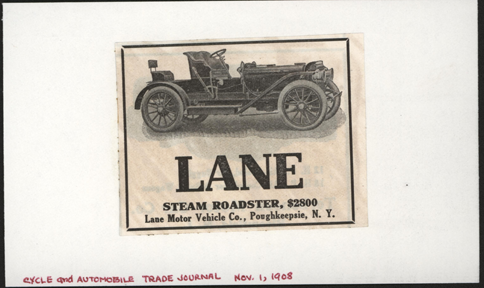 John Conde dated this Lane trade catalogue as 1907. It illustrated Lanes' Models 8, 9, 10, and 11. John A. Conde Collection. This advertisement is found in Floyd Clymer's Steam Car Scrapbook, (1945, Bonanza Books, Crown Publishers, Inc.), p. 67. Clymer lists no source. A similar advertisement is dated 1907. This magazine advertisement lists the Cushman Motor Copmany as the selling agent for Lane's five models. Cushman lists itselv as "N.E. 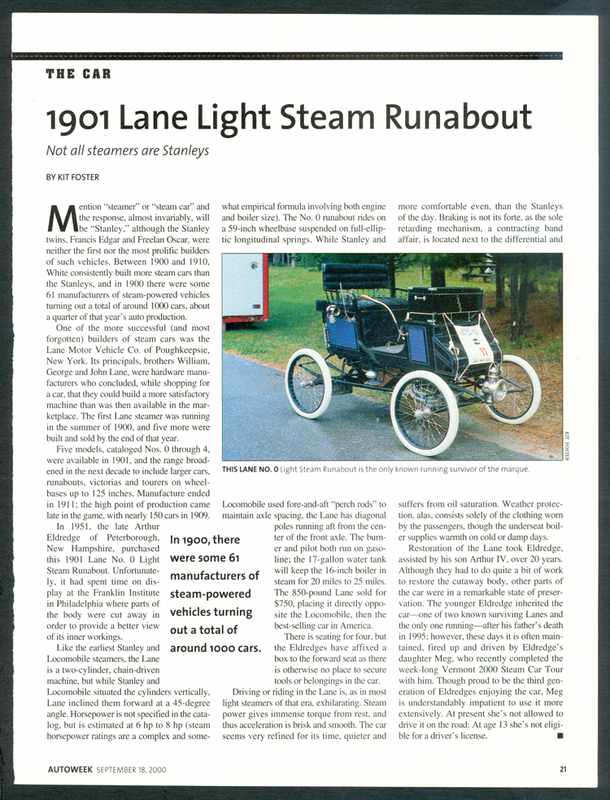 Distributors Lane Steam cars, Agents Wanted." In May 1908, the Lane Motor Vehicle Company placed this advertisement in the Cycle and Automobile Trade Journal, p. 327. Photocopy. John A. Conde Collection. In August 1908, the Lane Motor Vehicle Company placed this advertisement in the Cycle and Automobile Trade Journal, p. 215. Photocopy. John A. Conde Collection. In November 1908, the Lane Motor Vehicle Company placed this advertisement in the Cycle and Automobile Trade Journal. 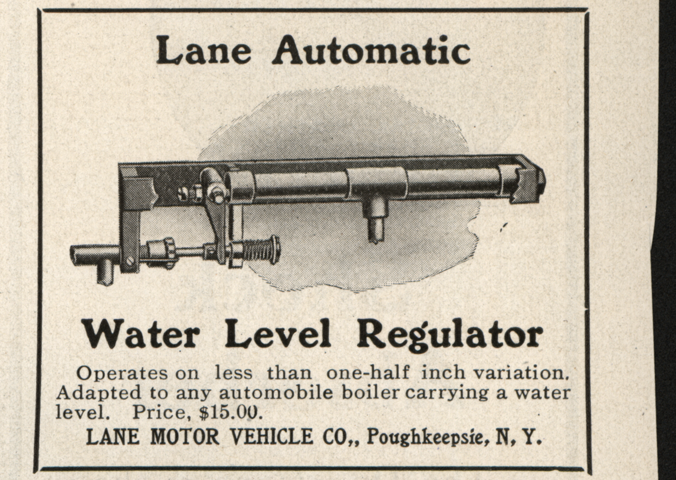 It is the first appearance of the smaller Lane advertisement. John A. Conde Collection. 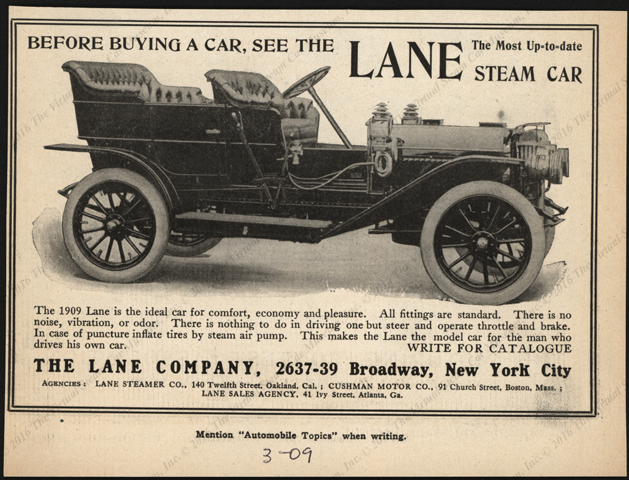 In January 1909, the Lane Motor Vehicle Company advertisements continued the smaller format and carried less copy. This advertisement invited readers to the New York Show, Grand Central Palace on December 21, 1908. Photocopy. John A. Conde Collection. The January 1909 issue of Horseless Age carried this small article about the Lane Company on January 6, 1909. It referenced two models. John A. Conde Collection. 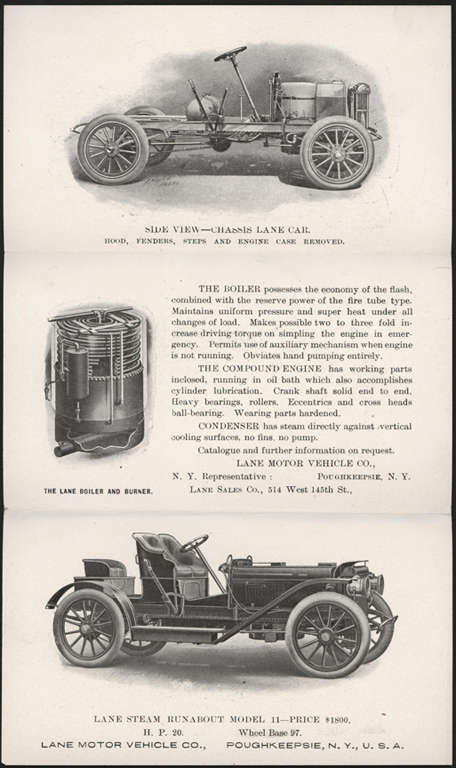 In March 1909, the Lane Company placed this advertisement in Automobile Topics. Note the different corporate name. None of the addresses are Poughkeppsie, NY, so this is likely a distributor or dealer. In April 1909, the Lane Motor Vehicle Company placed this advertisement in the Cycle and Automobile Trade Journal, page 309. 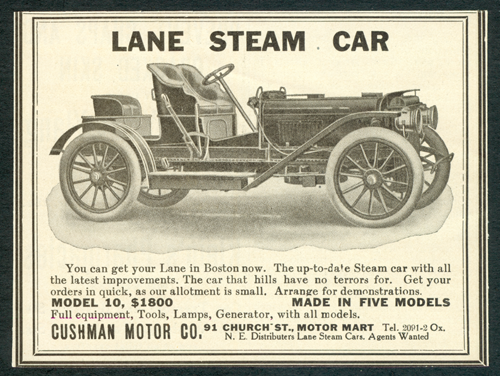 In April and May 1910, the Lane Motor Vehicle Company placed this advertisement in the Cycle and Automobile Trade Journal, p. 379 and 322. John A. Conde Collection. 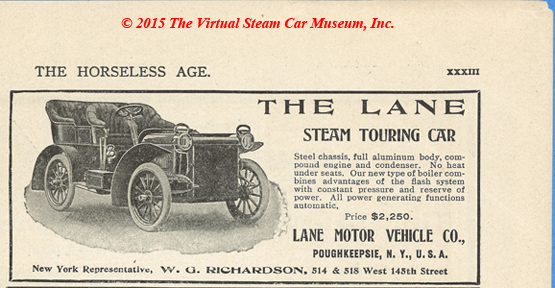 This June 1910 Lane magazine advertisement is the latest in the VSCM collection. It appeared in the Cycle and Automobile Trade Journal. John A. Conde Collection. John A. Conde's Lane File Folder. John A. Conde Collection. THe Long Island Auto Museum published this post card about 1978. It identifies car's owner as Mr. Arthur S. Eldredge, Sr. of Petersboro, NH. This image of only two surviving Lane Motor Vehicles appeared in a 1985 calendar. The December information sheet is missing. Kit Foster's Lane article in AUTOWEEK, September 18, 2000, p. 21. 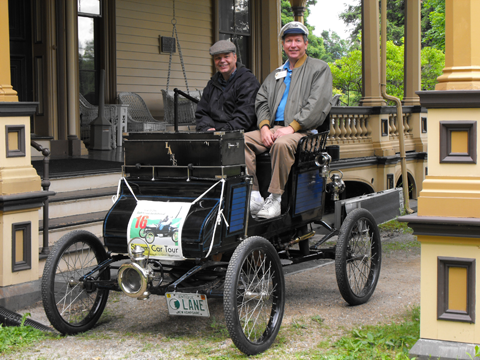 The driver is Arthur S. Eldrede, IV on the left and riding with him is then Director of the Stanley Museum, Dr. Donald Hoke. Vermont Steam Tour, June 2008. The New York-Buffalo endurance contest brought to light a steam carriage, the performance of which was in every way so remarkable that many a chauffeur wondered why he had never heard of the vehicle before. 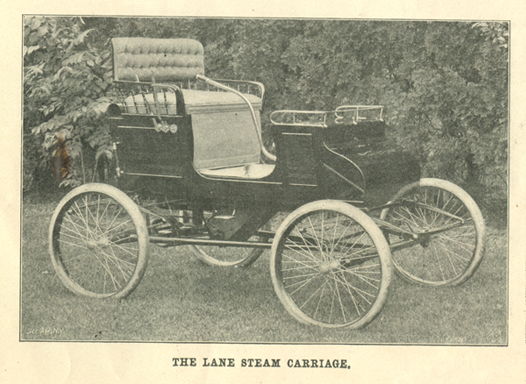 The carriage in question was made by the Lane Motor Vehicle Company, of Poughkeepsie, N. Y., and finished the run without any adjustment of the parts and without any injury with the exception of that sustained by one tire. It was the only carriage entered by the firm. Limited as the amount of space at our disposal is, it is impossible to devote as long a description to this carriage as might be desired. Nevertheless, there are several parts so distinctly novel in construction that they must be more or less fully described. Doubtless the most vital part of every automobile is its motor. The Lane engine presents some peculiarities, prominent among which is a frame, made up of straight rods suitably braced. Two of the rods constitute the slides and are surrounded by the cross-heads. The engine is mounted at approximately an angle of forty-five degrees to the axis of the vehicle's body. This arrangement is certainly meritorious, for the vibration is transmitted at an angle to the vehicle-frame. The crank-shaft is a solid piece of steel from end to end, and with it the sprocket, eccentrics, cranks, and counterbalances are eccentrically formed. Instead of balls, hardened interchangeable bushings are employed for the bearings. All parts below the cylinders are inclosed [sic] in a splash-tight copper case. In accordance with the best modern practice lubrication is effected automatically. Even the cylinders are mechanically oiled, for sufficient lubricant enters with the piston-rods. So far as the steam-generating apparatus is concerned, particular attention should be called to the burner. The vapor tubes are arranged in parallel series and are provided each with a single row of apertures for the issuing gas. Extending entirely across the burner above the apertured tubes is a mixer-tube. The air rising from below is brought into contact with each side of each flame and is caught by the flames on either side. The upward pressure or force of injection in the combustion-chamber is greater than in the ordinary types of burners. The combustion is odorless. The igniting and vaporizing device is worthy of particular attention. The vaporizing tubes, AA, are connected with a liquid-fuel supply pipe, B, provided with a hand-operated valve, C, for starting ignition, and with a regulator, D, which is automatically controlled by the boiler pressure, so that the consumption of fuel is nicely adjusted to the amount of steam generated. In order to heat the tubes sufficiently to start vaporization, an asbestos torch, E, is used, which receives a supply of wood alcohol from a cup connected by a pipe, F, with the torch. When the pressure in the boiler rises above a predetermined point, the fuel-regulator, D, cuts off the supply immediately. A blue flame pilot light within the combustion-chamber and directly below the vaporizers burns continuously independently of the main burner. With an eye to the possible necessity of making repairs the vaporizing tubes are made straight and are fitted with removable end plugs without the casing. The unfastening of a few screws permits the removal of the grate without interfering with the piping, and also of the vaporizers, torch, pilot light, and the entire burner case if necessary. It has been found a questionable practice time and time again to leave the regulation of the water supply entirely to the mechanism itself. In the Lane steam carriage, the operator is, therefore, expected to control the water supply to the boiler. Nevertheless, a simple safeguard has been provided which renders it quite impossible for him to carry the water higher than the maximum level, and which prevents the water from sinking too low. Connected with the boiler at a definite point is a pipe carried forward and connected with a steam-gage. Back of the steam-gage is a transverse pipe discharging into the live-steam pipe between the throttle-valve and the boiler. Should the water rise to the opening of the first-named pipe, it will flow to the steam-gage, thence by the transverse pipe to the live-steam pipe, and thence through the cylinders of the engine. The exhaust-pipes carry the water back to the water tank. This simple method of maintaining a constant level has been found in practice to be extremely efficient. It is not necessary to renew a broken waterglass on the road; the pump is simply turned on, and the operator continues his journey. In most motor vehicles, air is supplied by a hand-pump, with the result that the pressure over the fuel supply constantly decreases, and the fuel is supplied to the boiler at a gradually diminishing pressure. Hence it has been a matter of unusual difficulty to supply fuel to the burner in constant quantities. In the Lane carriage the pump and the engine are inclosed [sic] in a common casing. The piston of the air-pump is rigidly connected with the piston of the engine. Hence it follows that the pump and engine pistons have a corresponding movement, so that the amount of air supplied is absolutely dependent upon the work performed by the engine. Outside of the engine casing is a regulating valve for the air-pump. A regulating screw, likewise without the casing, is provided, in order to vary the air pressure. The screw in question merely increases or decreases the clearance space between the valves and thus regulates the pressure to a nicety. The device relieves the operator of all the necessity of hand pumping. The feed-water for the boiler is heated by the exhaust steam from the engine, and whatever exhaust steam is not thus condensed is wholly or partially absorbed by the products of combustion. A pipe connected with the exhaust .of the engine is carried under the body of the vehicle, and discharges directly into the water tank. The moisture contained in the steam is absorbed in a considerable measure by the gases. As a consequence the mingled body of exhaust steam and gases discharged will be quite invisible. The flues through which the products of combustion from the burner pass are arranged in a peculiar manner. A horizontal flue over the boiler communicates with an upper and a lower downwardly-discharging flue. When the vehicle is at rest the products of combustion are carried through the upper downwardly-conducted flue; when the vehicle is in motion and aided by the injector action of the exhaust steam, the products pass through the lower-most downwardly-extending flue. All the products of combustion are thus caused to traverse a downward path when passing from the horizontal flue over the boiler. By reason of this downward trend of the flues, the products of combustion will not be picked up by moving air currents and driven directly upon the occupants of the vehicle. Much could be written upon the structural novelties embodied in the running gear of the vehicle, as well as in the minor portions. There is, perhaps, not a single part of the carriage that does not, in some way, show an improvement upon previous constructions. 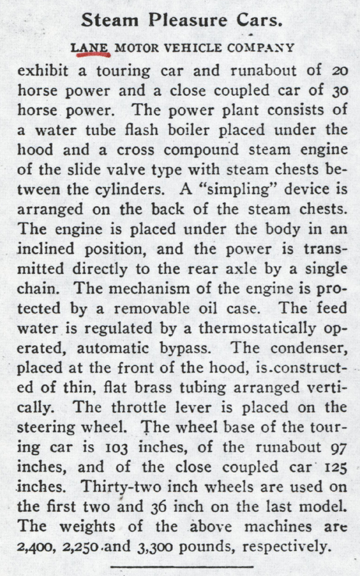 The Lane Steam Carriage, Scientific American, March 1, 1902, p. 138. Contact us if you have additional information about the Lane Motor Vehicle Company, or if you have questions.